By now, we are all familiar with MoviePass, a subscription-based movie ticketing app. What you probably didn’t know is that the company has been offering a service to buy discounted movie tickets since 2011. Then in 2016, Mitch Lowe, a top level executive during the genesis of Netflix who would go on to be President of RedBox for a couple years, came along and decided to experiment with a subscription based service for buying movie tickets. Hmmmm, subscription based entertainment, I wonder where he got that idea… Anyways, the company started experimenting with different plans to help moviegoers buy cheaper tickets. This consisted of plans like $15 to see two movies a month or $50 to see unlimited movies a month. They got about 20,000 subscribers through this new plan, but they really weren’t growing fast enough to sustain the business model. Enter Helios and Matheson, an analytics firm. They purchased a major stake in MoviePass in August 2017 and wouldn’t you know it, MoviePass slashed the price of their unlimited plan to only $10 a month (minus seeing two movies a day, the same movie more than once, or 3D/IMAX movies). Gasp. The news went viral. You could see a movie everyday for a year and only pay $120. Movie tickets cost between $10 and $17 dollars, so if you saw a movie everyday for a year it would cost you $3,650. And that’s a conservative estimate! And if you are confused at how this business model will work, let me break it down for you: You give MoviePass $10 a month to go see as many movies as you want. When you buy a movie ticket with MoviePass, they pay full price of the ticket, basically subsidising your trip to the movies. So you could go see twenty movies for ten dollars, and MoviePass pays for those twenty movies and you only paid ten bucks. They clearly are losing money when people see more than one movie per month, and that’s basically the case for everyone that subscribes. “THIS BUSINESS MODEL STILL DOESN’T WORK.” Of course it doesn’t. That’s because MoviePass doesn’t even really care about selling movie tickets. “I knew it! They are trying to sell my data!” I’m going to give MoviePass the benefit of the doubt here and assume they aren’t straight-up selling your data. MoviePass claims they don’t (So did Facebook) and it kind of makes sense that they don’t necessarily have to. They are going to use it, though. Whether or not they are making money by selling subscription based movie tickets (which they aren’t), MoviePass now has a subscriber base of 2.7 million users thanks to their genius marketing. They know that their unlimited plan is too good to be true and they used this as leverage to aggregate users. Now they have the full name, email address, phone number, and home address of 2.7 million people. MoviePass, or Helio and Matheson for that matter, knows that we are living in an attention economy. Facebook, Instagram, Twitter have found success in ad revenue because basically everyone carries little billboards in their pockets wherever they go. MoviePass is looking to cash in on that as well. And I think it goes without saying that MoviePass now has your attention. Banner ads isn’t the only way MoviePass is going to make money (notice I didn’t say selling movie tickets). They want to basically control your entire “going-to-the-movies” experience. They have begun experimenting with partnering with restaurants and ride sharing apps. You go on your MoviePass app to buy tickets to a show. While you are checking out, MoviePass tells you that if you show your MoviePass ticket receipt you get 10% off at The Cheesecake Factory. You aren’t getting a discount because you’re special. You’re getting a discount because TCF paid MoviePass a lot of money to put their coupon (basically an ad) in front of 2.7 million pairs of eyes. And when you go to TCF and use that coupon, both MoviePass and TCF see the data that shows the ad worked. So TCF realizes that MoviePass is a valuable partner and decides to give them more money to continue putting their coupons and discounts on their app. And this translates to basically any service that inhabits the movie going experience. You book an Uber ride through the app after you buy tickets (because you know I can’t see a superhero movie without some super beer-o) Whether or not you got a discount, MoviePass put Uber in front of your face so MoviePass is going to get that dinero. If you didn’t see it coming already, MoviePass is going to market movies on their app too. You’re on their app to buy tickets anyways so pushing a movie would be insanely easy. And because they know your movie preferences, they know exactly how to market to you. This is actually a great tool for indie movies that have trouble marketing to the level of big studio films (The new Jurassic World movie had an estimated marketing budget of 185 MILLION dollars). As an indie, you don’t have money or time to put on those grandiose exhibits or marketing stunts that may or may not work. You want to put up an ad and know exactly how well your ad is doing with MoviePass’ network of 2.7 million subscribers. Remember when I said MoviePass wants to control your entire “going-to-the-movies” experience. Recently, the film American Animals premiered in New York and Los Angeles to a relatively good opening for an indie opening in two cities. What many people that haven’t seen a trailer or the movie noticed was, American Animals was co-acquired by MoviePass during Sundance this January through MoviePass Ventures, their acquiring and distribution branch that they conveniently founded in January too. Now this changes the business model quite a bit. Movie theaters basically give the majority of ticket sales back to the distributors and really make their money on overpriced popcorn and drinks. 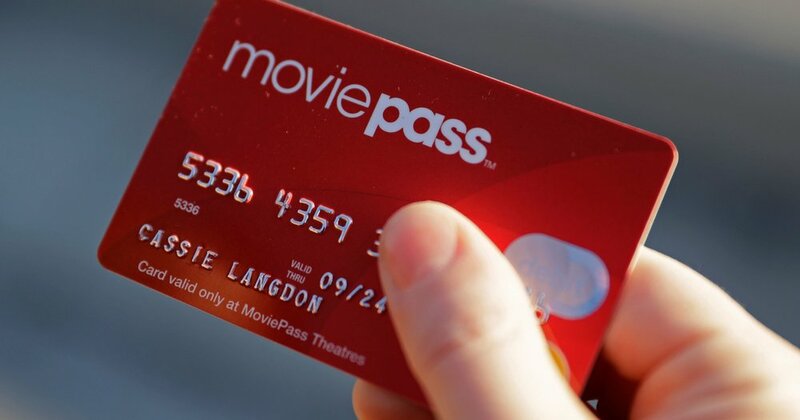 Now let’s think about this: When you buy tickets on MoviePass, they end up paying full price to the movie theater. The movie theater then has to give a portion of that ticket sale to the distributor...Oh snap. That means for a movie like American Animals, MoviePass actually gets some money back. Now that unlimited movie plan starts to make more sense: Acquire a bunch of movies, market those movies more heavily than other movies on your app, and watch that backend money trickle in. Now, if only they could produce their own movies to streamline the process and take out the expense of purchasing a movie outright at a film festival. Well, you probably have figured out by now that MoviePass doesn’t just want to send you to the movies. They don't just want to acquire movies. They want to make movies. MoviePass recently co-founded MoviePass Films with EFO films. This deal with EFO films also means that MoviePass has access to their library and production slate. As we’ve seen with Netflix, creating your own content means you don’t have to pay those pesky licensing fees or count on third party creators to deliver. MoviePass is trying to become the Netflix of going to the theater, and of course they are. Mitch Lowe used to work there and he misses the old days. And Mitch Lowe ain't no dummy. People love to sit on the sidelines and say that MoviePass’ business model can’t make money and will inevitably fail. But Mitch has been through this before. Netflix, which was started in 1998, almost went out of business too because of the dot-com bubble and fear that internet based companies couldn’t turn a profit. Oh, how naive we were. Netflix stuck to its guns and is now...Netflix. And Mitch is confident that MoviePass will do the same because of its similar business model. They both grew a large subscriber base and then used that subscriber base in creative ways. For Netflix, it was never about mailing DVDs, it was about making it easier to watch your favorite movies at home. For MoviePass, it was never about selling movie tickets, it was about better selling the movie-going experience.